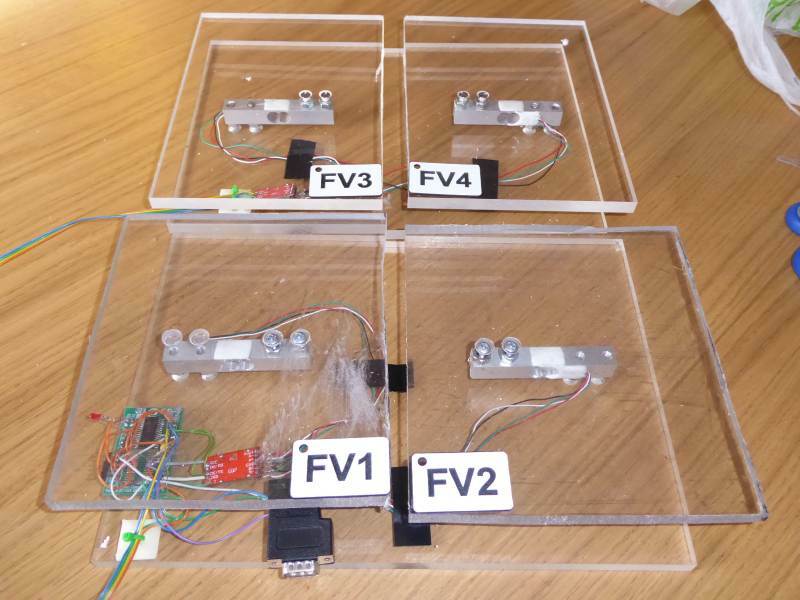 The 4 completed weighing scales. Since I created my little brewery I’ve been using the bubble counting system I put in place which is described on my other blog post. Basically it counts the number of bubbles which move through an air lock. This allowed me to figure out at what rate the fermentation was progressing. Although it was a satisfactory method to do this, it did have some problems. 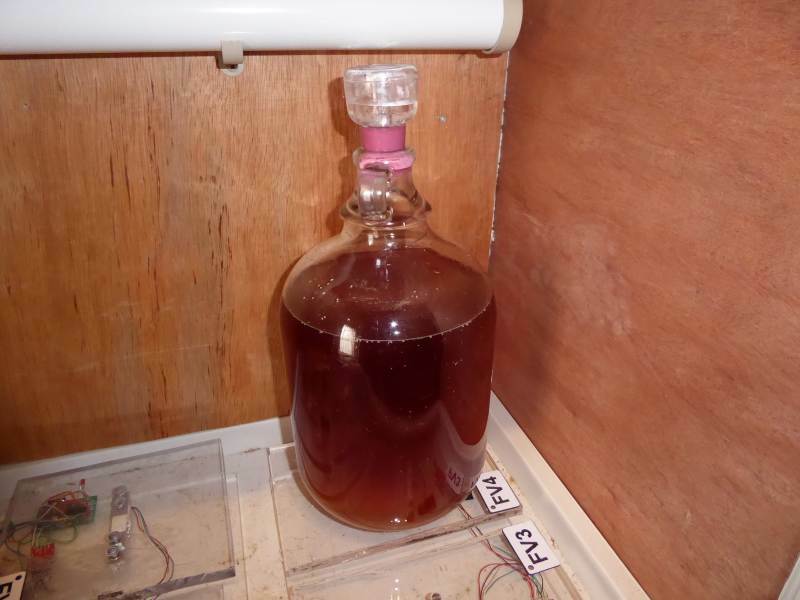 An example of these problems is that sometimes the airlock would get clogged up if the fermentation was quite excessive, or the bubble counting sensor was not quite in the right location it didn’t correctly count. As the bubble counter had to be placed on the demijohn for every fermentation it was always going to be a slight problem, also wiring of all the bubble counters and it trailing around my fermentation enclosure was not very nice. 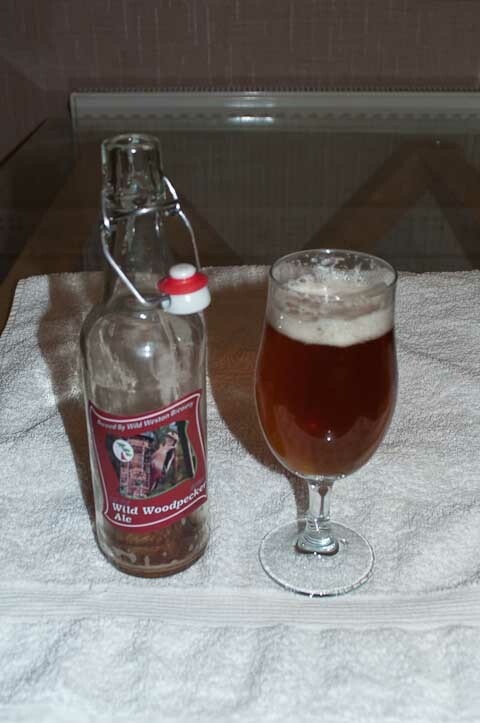 To resolve this problem I decided to try a different method of measuring fermentation via a drop in weight. When fermentation is taking place in the beer the sugar within the fermentation vessel is converted into carbon dioxide gas (CO2) and alcohol. 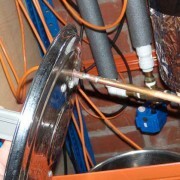 The carbon dioxide is then released through the airlock into the outside air. This CO2 which is created can then be measured by a loss in weight of the fermentation vessel. After testing my demijohn full of beer to see what the weight would be I found it to be about 7 kg, Unfortunately our kitchen scales would only measure 5kg so I couldn’t test the principal with them. So I purchased a new set of scaled which could measure 10kg in weight. Unfortunately when I tried to use these every time you come to measure the weight again you have to zero the scales which meant moving the demijohn with beer off the scales, resetting it and then placing the beer back on the scales. This then meant if was slightly in a different place on the scales and read slightly differently. This is what I found anyway and as the amount I am trying to measure is only 10’s of grammes at a time this was no good. So I then put together the bits I needed to make my own weighing scales which I could interface with my whole brewery to properly view the fermentation progress. 4 off 10kg load cells, These work out about 4 pounds each from ebay. 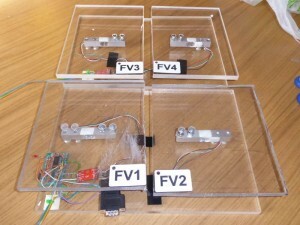 4 Sheets of a4 10mm thick clear plexiglass, these also work out about 4 pounds each from ebay. And a PIC16F1933 – 8-bit PIC Microcontroller from Microchip , I already had this but the general cost for these is about 2 pounds. Also a small circuit board for mounting the small microcontroller which I also already had but cost originally a few pounds also. The general principal is that the HX711 weight sensor modules are capable each of reading the weight measured from two load cells so two load cells are wired into each of these modules. These modules are then read by the PIC16F1933 microcontroller which then relays the information onwards to my pokeys 57e board which I use for the rest of my brewery. I could of alternatively wired an LCD display into the PIC16F1933 microcontroller and had it simply display the current weights from all the load cells. This may be an alternative way of doing it if you wanted to do a similar thing. Plexiglass after cutting the top platform sheet into two. 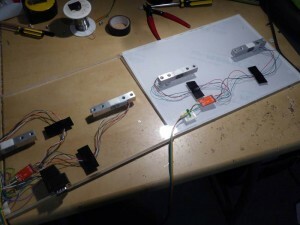 To build the actual weighing scales, I first cut two of the sheets of plexiglass straight across the middle. These would form the top platforms where I would place either demijohn when fermenting. I found the easiest way of cutting this plastic was using my oscillating multitool by gently going back and forward over the place where I want the cut. This gave a nice clean cut. I did try using a fret saw on the first piece but this was nothing like as nice. 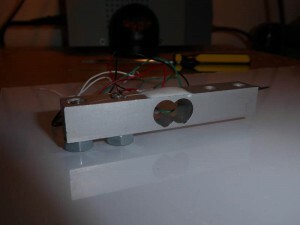 Load cell mounting on the Plexiglass using two nuts as spacers. 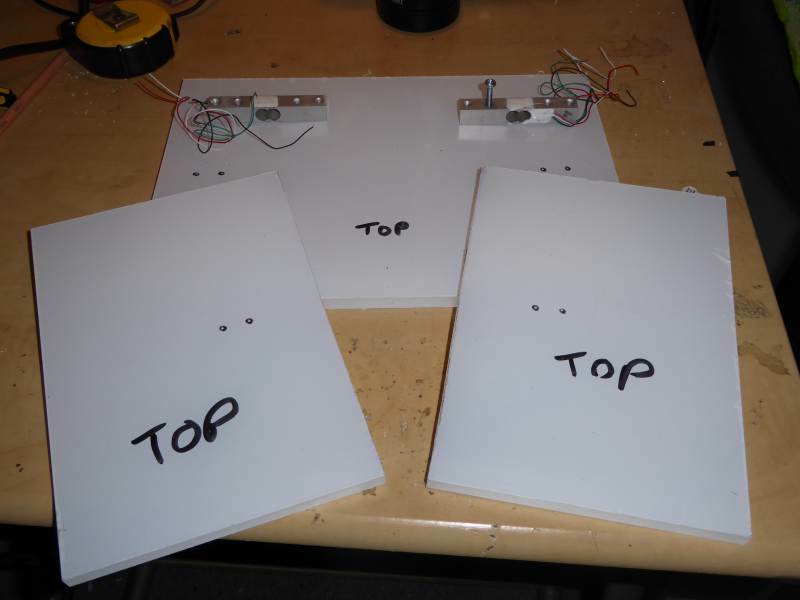 I then drilled four holes in the bottom sheets where the load cells would be mounted. Using recessed bolts so the bottom could lay flat. I then did a similar thing with the top platforms and mounted the load cells with bolts using nuts as spacers. 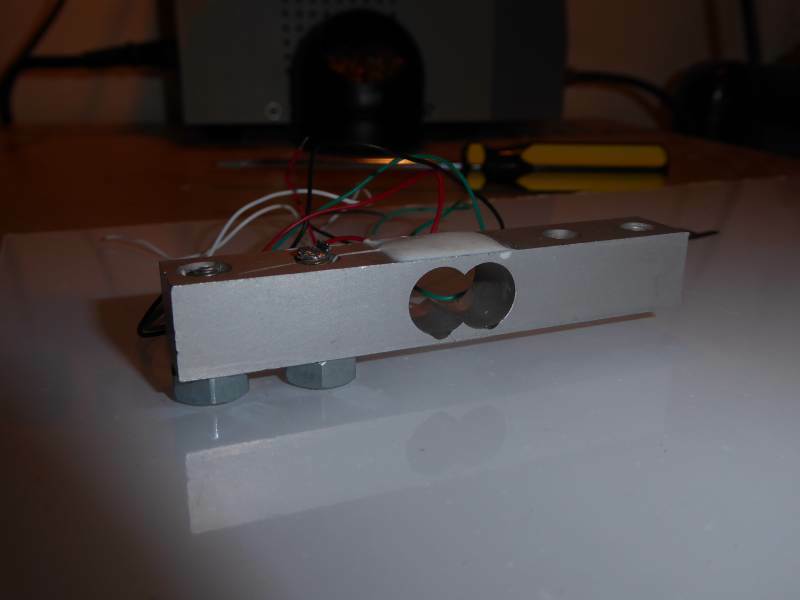 This is needed because the load cell flexes slightly downwards to measure the actual weight so there needs to be a space between the platforms and the load cells. 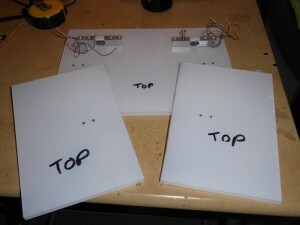 The weighing system wiring prior to putting the top platforms on. It was then a simple matter of wiring the load cells to the HX711 modules and then wiring these modules to the PIC microcontroller. 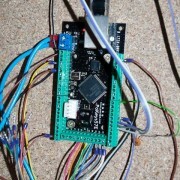 Oh and also to write the software for the microcontroller, after a week of playing with this I had it working fine and now its in use for all my fermentations. The final aim is to have the system email or text be telling me whether fermentation is progressing correctly and when fermentation is completed but for now it simple displays a graph of how much CO2 has been created. The first brew tried on the scales. So far I’ve used the system on two brews I’ve made, with two more active as I write this. All so far looking very good. And just being able to place the demijohn straight onto the scales without having any cables to worry about is great. The graphs below show the two completed fermentations so far, with one showing about 146g of CO2 being created and the other 226g of CO2. The first one was not as smooth as I was playing with new circulation fans in the enclosure which seemed to wiggle the weight measured slightly, Also you can see from the second graph that fermentation completely a lot quicker on the second brew. That was because I increased the temperature in the enclosure slightly to see if it had any affect, which it obviously did. 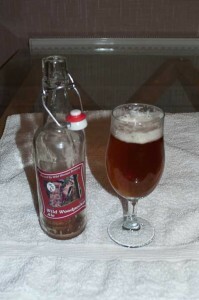 Here are a couple of pictures of the first brews I’ve made using the brewery. All of the brews were pale ales of one kind of another, Quite simple recipes to test things out. The names are from left to right, Spikes Pale Ale, Cheeky Squirrel IPA and Wild Woodpecker Ale. Everyone who has tried them has been very complimentary about them so I guess they can’t be that bad. A tip I got from one the home brew forums was to print the labels out on standard paper using a colour laser printer and then stick them onto the bottles my putting milk on back. I had my doubts about this working but it was a resounding success and everyone has been impressed with the quality of the labels. 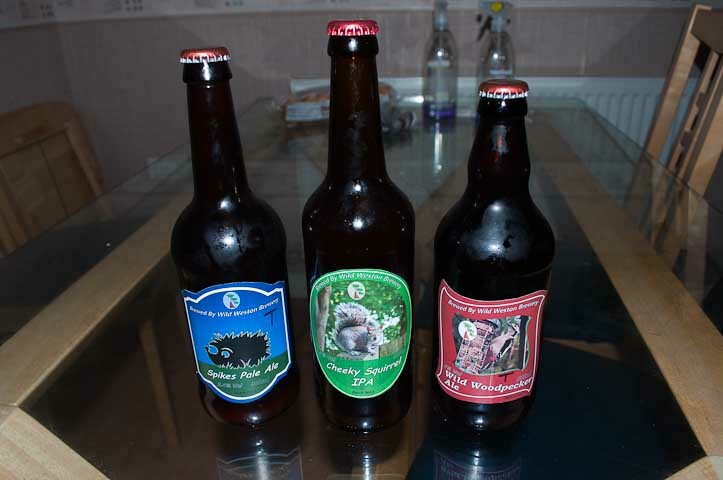 The ideas and names of the brews were created from things the family has seen in the garden this year, And the labels have photos on them of the animals. We couldn’t really come up with any better ideas anyway. The beer in this photo is the last remaining bottle of the first few batches, I think I’ll have to get a move on and brew some more.